AT&T Inc. T recently announced that as part of its 5G deployment in a dozen cities in 2018, it will launch mobile 5G service in certain areas of five cities — Houston, Jacksonville, Louisville, New Orleans and San Antonio — this year. These add to its previously announced seven cities of Atlanta, Charlotte, Dallas, Indianapolis, Oklahoma City, Raleigh and Waco. The U.S. telco giant added that it is planning to bring mobile 5G service in parts of Las Vegas, Los Angeles, Nashville, Orlando, San Diego, San Francisco and San Jose in early 2019 to take the tally to 19 cities and will expand thereafter. Notably, AT&T’s 5G deployment will entail utilization of millimeter wave spectrum to deploy 5G in pockets of dense. In parts of urban, suburban and rural areas, the company aims to deploy 5G on its mid and low-band spectrum holdings. Of late, in Waco, TX, in collaboration with key technology suppliers, the company made the world's first wireless 5G data transfer over millimeter wave using standards-based, production equipment with a mobile form factor device. Further, the company’s 5G Evolution technology is now live in more than 200 markets, and expected to reach more than 400 markets by the year-end. AT&T is working with cutting-edge technology equipment manufacturers such as Ericsson ERIC, Nokia Corporation NOK and Samsung to build its mobile, nationwide 5G network. This, in turn, will enable the telecommunications service provider to deliver on its promises of high-speed connectivity and low latency to its customers. It has already started deploying 3rd Generation Partnership Project Release 15 compliant equipment in a few of its early 5G cities. Over the past five years, AT&T invested around $145 billion in wireless and wireline networks, including capital investments and acquisition of wireless spectrum and operations. Currently, the company’s wireless network covers more than 99% of Americans. Its fiber network is one of the nation’s largest and it connect more Internet of Things devices compared to any other provider in North America. In the past year, shares of AT&T have lost 10.7% compared with 0.4% decline for the industry. It remains to be seen whether the national carrier’s service expansion strategy can help it improve profitability in the course of time. 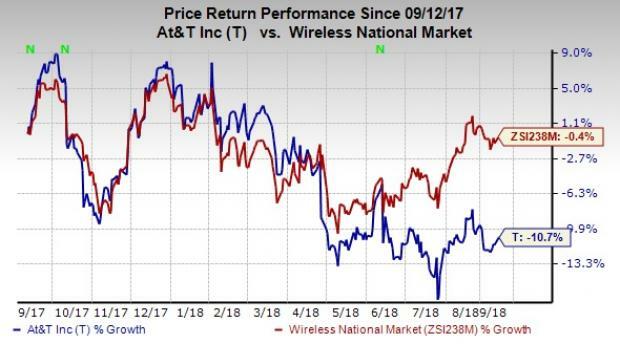 AT&T currently carries a Zacks Rank #2 (Buy). Another top-ranked stock in the industry is United States Cellular Corporation USM, sporting a Zacks #1 Rank (Strong Buy). You can see the complete list of today’s Zacks #1 Rank stocks here. United States Cellular has a long-term earnings growth expectation of 1%. It surpassed earnings estimates thrice in the trailing four quarters with an average positive surprise of 303.6%.